France’s National Assembly has overwhelmingly backed President Emmanuel Macron’s controversial rail reforms. 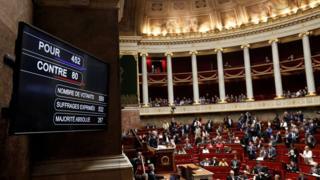 In a blow to the country’s unions, French MPs voted 452 to 80 in favour of the bill overhauling the country’s state rail company SNCF. The bill marks the biggest change to the company since rail nationalisation in the 1930s. Rail reform is a key plank in Mr Macron’s efforts to change the economy. Can President Macron transform France? Under the law, new employees will lose generous job and pension guarantees, while SNCF will turn into a joint-stock company and lose its domestic passenger monopoly in 2020. The unions say this is a covert step to future privatisation of SNCF, but the government insists it will not sell any of the stock. Mr Macron’s government has also written off €35bn ($41.1bn; £30.1bn) of SNCF’s €47bn debt, to allow the company greater financial leeway to prepare for competition from other European companies. Previous efforts by French leaders to implement change against the wills of the unions, including Prime Minister Alain Juppé in 1995, fell flat in the face of social unrest and weeks of strikes. France’s rail unions began three months of rolling strikes in April in their bid to thwart the reforms, but polls show commuters have grown frustrated and public support has started to move behind the government’s plans. Last month, 95% of striking rail workers voted against the government reforms in a ballot SNCF derided as a petition. However, the CFDT union, considered to be one of the more moderate, has signalled it will support the measure and that its members will return to work after the end of the strikes on 28 June.